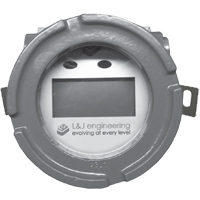 L&J Technologies is constantly making the job easier for the end user. One of these ways is by offering a Ground level Display to the L&J Engineering line of products. L&J makes it no longer necessary to climb to the top of the tank to access the desired information or perform any of the programming functions. The MCG 1350M Ground Level Display comprises a circular cast aluminum alloy housing having a circular threaded cast aluminum alloy cover which incorporates a flat circular window for observation of an internal display. The internal equipment is comprised of a PCB with the graphical LCD assembly. Power is provided by the host equipment.